PLENTY OF WINE FOR AFTER BEDTIME. Therefore, I've gone ahead and compiled a short list for you of some cold weather essentials we wouldn't be able to survive a winter without. I promise you, some of these might even pacify the pickiest of kids who refuse to put on torturous things like gloves and/or boots. StrideRite Made2Play Sneaker Boot: If there is anything more difficult to squeeze your toddler into than gloves, it's boots. I don't know what it is about boots but my kids are incapable of shoving their foot all the way down on the first, second and third tries. These Made2Play Sneaker boots by StrideRite eliminate the hassle of shoving your child's foot into a clunky, heavy boot by bringing together a flexible lightweight sneaker and seam-sealed, fleece-lined upper designed to keep warmth in and water out. What's even better is that these "snoots" are so flexible they can easily be folded up and tossed into any bag for on--the-go fun. Available in many colors and even a couple of fun character prints, be sure to head to StrideRite to learn more about them. Kid's Snow Bib : If I learned anything at all from six winters as a parent, it's that snow bibs are greater than snow pants in all of the ways. Okay, maybe not so ideal when someone inevitably shouts, "I have to go potty!" but the less ways for snow to creep into someone's pants, the better. We love these snow bibs but the truth is, any snow bib will do whether it's a $70 Columbia brand suit or $15 suit from OshKosh. We've tried them all, trust me. 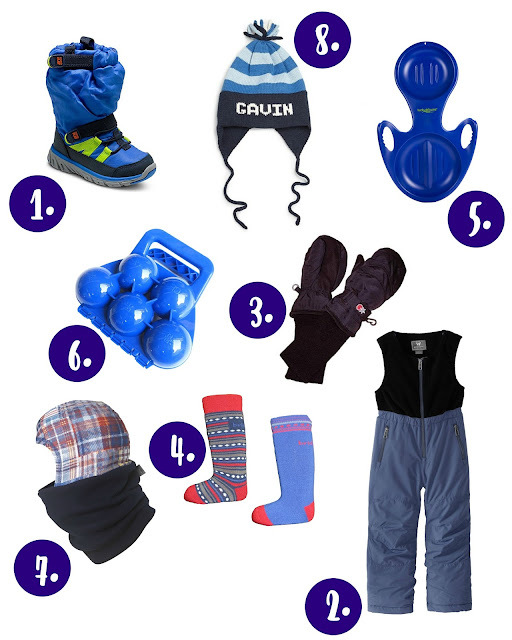 Kid's Merino Ski Socks : One surefire way to ruin any fun snow day is wet feet. We've found that merino ski socks are the best at keeping little feet warm and dry and do you know what little warm and dry feet like to do? Not come inside three and a half minutes after they walked outside. Winner winner, chicken dinner. Lucky Bums Plastic Torpedo Sled : Lightweight and easy enough FOR THEM to drag back up the hill once a pull string is attached. Need I say more? Original Turtle Fur Fleece Head/Neck Shell : Whether they're throwing snow, rolling in it or making snow angels, snow inevitably finds it way down the backs of my kids jackets and the minute it hits their warm chubby necks, you'd think they were melting in a pit of molten lava. Toddler scarves? Forget it. Turtle Fur is the way to go. It might look like we're headed out on an Alaskan Frontier adventure when my boys leave the house for snow play but one thing is for sure, once they're dressed they stay warm AND dry the entire time they're out there. This is a must-have. Monogram Knit Hat: Of course your child doesn't need a monogrammed knit hat for the winter months but this hat from Bridier Baubles The Monogram Shop is one of my absolute favorite winter pieces. The best part is that it starts getting use during the chilly Fall months and keeps our tiniest head warm clear through the winter ones. Growing Up On Cherry ChapStick. Snapchat Made Me Do It. Baby's First Valentine's Day: Stuff We LOVE!